On paper, Kim should be completely impenetrable to anyone who doesn’t enjoy reading Rudyard Kipling and have a clear understanding of the Indian caste system in the 19th century. 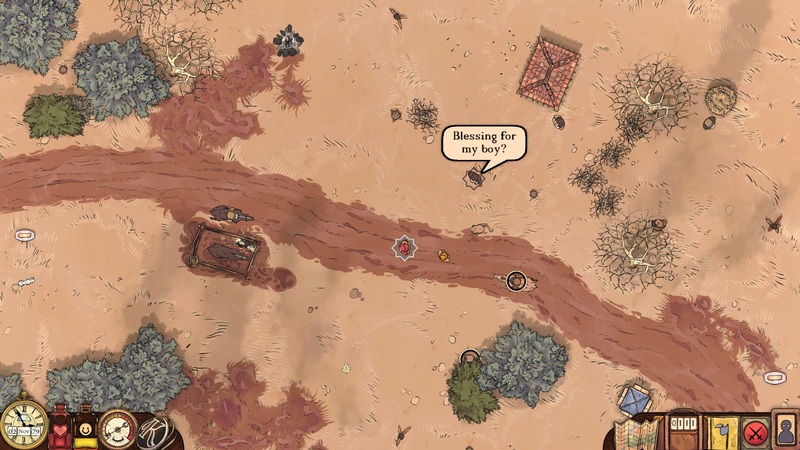 This top-down, text-heavy, point and click RPG is tutorial-light and content heavy. After a brief scenario which sets up how to move about and speak to people, you’re left to your own devices, forging your own path for teenage beggar Kim. Not only that, but even the open world is not set in stone, with replays throwing up different characters and scenarios, even if you choose the same path. The game ends when Kim reaches a certain age, but it’s up to you how he gets there. The text-based dialogue and narration is straight out of Kipling, a real surprise to the modern gamer, and takes some adjusting to. And yet. And yet, there is something unmistakably magical about the world you are allowed to inhabit and explore, and part of that lies in exactly the things which should make the game impenetrable. The key is Kipling’s writing. 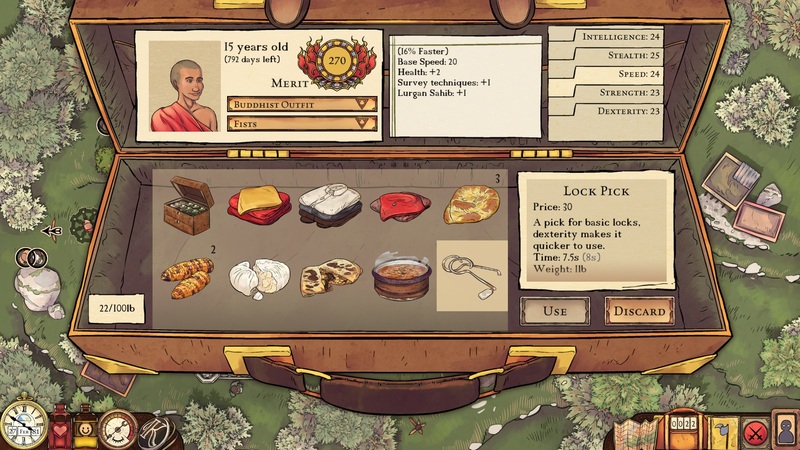 The game uses sections of the text from his celebrated novel of the same name in parts of the dialogue. The words are carefully crafted. Like the best drama, the language is the world. And with some quite nuanced dialogue choices, it is a bit like a 1980s gamebook written in the 1880s. “I have known many men in my so long life, and disciples not a few. But to none among men, if so be you are woman born, has my heart gone out as it has to you. Thoughtful, wise and courteous; but something of a small imp” you feel rewarded. You start to realise how much the archaic language is shaped by the actions of the player, how you have chosen to play the character. It isn’t long before the language, like the top-down cell-shaded art style, starts to get under your skin. What initially seems like a simple yet challenging game of managing hunger and sleep via tamagotchi-esque depleting bars becomes a very deep and rewarding experience. The soundtrack is subtle and atmospheric, the map-heavy visuals give you the impression of leafing through dusty tomes or playing a long-forgotten boardgame. You are left with a sense of a whole menagerie of well-rounded intricate characters, each in their own way trying to survive and better themselves within a rigid caste system and a complicated interplay between three religions, as well as a myriad of personal superstitions. Over all of this hangs the British Empire, fumbling as it did with things it never truly understood. 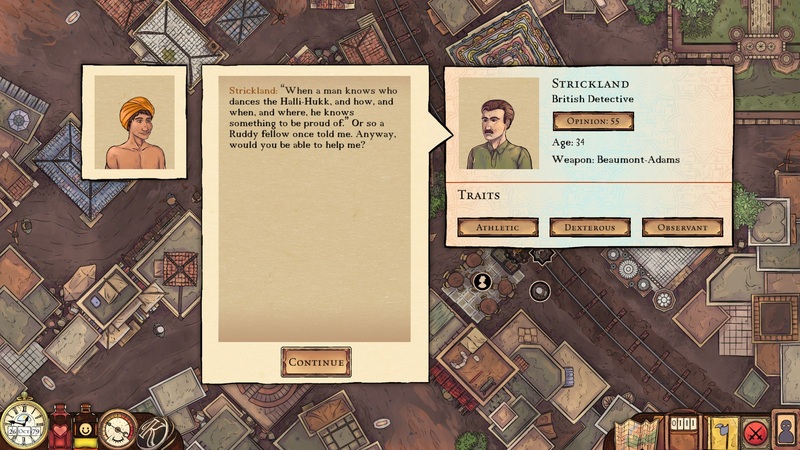 While some see Kipling’s work as defending the role of British Imperialism in India, largely through the protagonist’s work as a spy for British intelligence, the game takes a step back, using it as the backdrop through which the player must navigate. And despite the specific setting at no point do you feel as though you are being subjected to a history lesson, or that you are missing out because you haven’t read the source material. That is because of the care taken by London-based developers Secret Games on the narrative structure of the game. Yes, there is a combat mode, and a stealth mode, but this player didn’t feel the need to use them outwith moments where they were absolutely necessary. And given it is based on such a respected literary masterwork, given it is so beautifully written and illustrated, it is an absolute marvel that this game is procedurally generated. I had to keep visiting the game’s kickstarter blog to remind myself that it was. The game started life as an FTL-style roguelike, according to the games designer Jeremy Hogan, but it has become so, so much more. Incredibly this kickstarter was funded for just £5,303. It makes you wonder why so many AAA titles with a budget of millions are so shallow, linear, juvenile and, well, similar. when i saw the link to this, it looks like you gave it a 0/10, when you actually gave it a 9/10!? We had a problem with the plugin that does the score graphics. Some older posts still show as 0, but all reviews have a score at the end.